Grayson is one of those people who doesn't like his food to touch. Meaning, he either keeps the different foods on his plate totally separated by a buffer of untouched porcelain, or -- HOLD ONTO YOUR HATS -- he uses different plates and bowls for each food. For instance, if we're having black-eyed peas, corn, baked potatoes and grilled chicken, he'll put the black-eyed peas in a bowl, the corn on a dinner plate, the baked potato on a salad plate, and the grilled chicken on yet another salad plate. THE DISHES, Y'ALL, THE DISHES. The man generates more dirty dishes than the state of Florida. But in general it doesn't bother me for my foods to touch. As a matter of fact, I'm a huge fan of mixing certain foods. I LOVE to mix black-eyed peas with rice. I LOVE to slice open a yeast roll and spoon mashed potatoes into it. 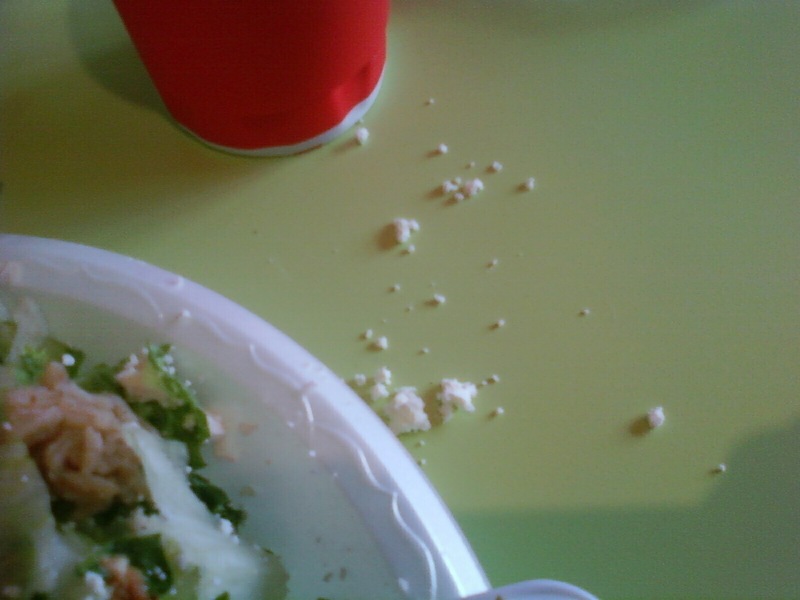 I routinely mop up the last of my grilled chicken plate at Zoe's with my last pita triangle. Which brings me to the point of today's post: I've recently changed the way I eat one of my very most favorite meals in the entire universe, and even though it's kind of gross, I'm going to tell you about it anyway. Zoe's Kitchen is one of my two favorite restaurants, and my favorite meal there is the aforementioned grilled chicken plate. 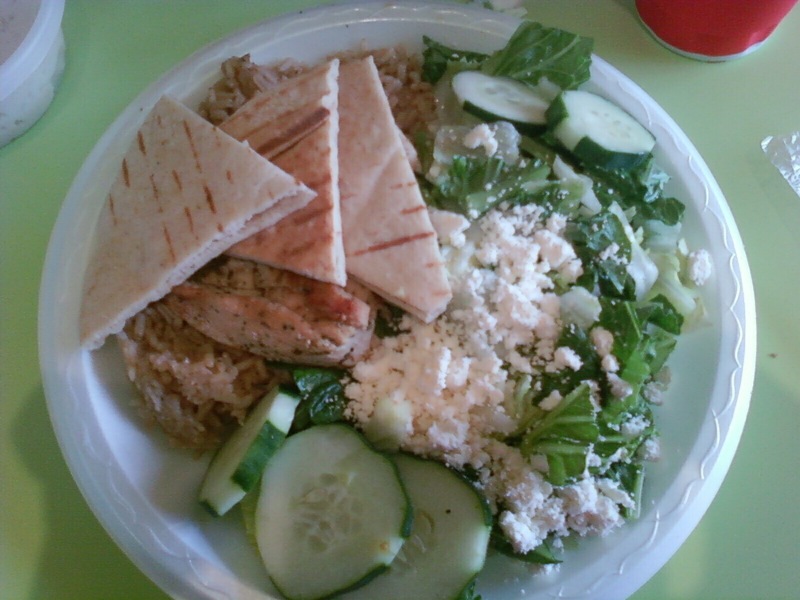 It includes grilled chicken, brown rice, salad with feta and cucumbers, and three pita triangles. About a month ago, I realized that my favorite bites were close to the end of the meal, when what was left on the plate was sort of all running together. So one day, I decided to mix it all up at the very beginning and see how it tasted. (Grayson is probably gagging right now.) After all, it would really just be a grilled chicken salad with some brown rice thrown in. DEE-LISH. HEAVEN. Oh, it was sooooooo good. Now I mix it up every time I eat it. Never mind that I make a complete mess of my table when I mix it up. 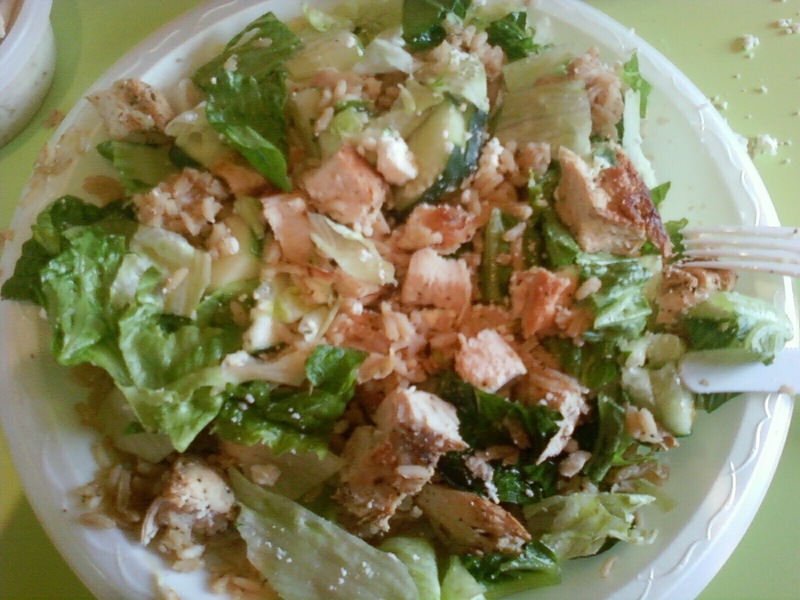 Um, that was after I'd already picked up all the lettuce that'd fallen on the table. They really need larger plates. Who knew rice would be so good folded into a salad? NOT I. And I can't say that it will make me more daring about mixing foods, but I'm totally in love with this combination. Looks SO good. I think I need to go eat breakfast now. Mixing food is the bomb. On Thanksgiving, I would get everything on the plate in one bite if possible. Grayson needs to start doing the dishes! I am not one who really enjoys the combined mess look...despite the look of my sewing room, I do like order. BUT, separate dishes means more washing & more putting away. UGH! I told my husband that I really would like a huge laundry room with a huge closet area. Everyone would just come to the laundry room to get dressed. The day he asked why his shirts were hanging in the laundry room, I told him that HE could walk them upstairs to the closet. Last day I put his clothes away for him. You can teach an old dog new trick! Food was meant to be mixed up!